In these days of political spin and media hype, when every detail of celebrity life and sporting prowess is grist for commentary by tabloid journalists, media analysts and public relations gurus, it is rare to find a product or service which has performed reliably for thirty years. Say, for example, a service which is free of charge and of undoubted benefit to the wider community. A service which has been offered week in and week out, year after year by a core of dedicated individuals who have, at the same time as providing support for the injured, also driven forward improvements in the political, legal and social climate. The Asbestos Diseases Society of Australia Incorporated (ADSA) is such a service.1 Founded in 1979 to meet the needs of ailing asbestos mineworkers, the ADSA is now one of the world's foremost authorities on the needs of people with asbestos-related diseases. It is telling that rather than celebrate the completion of three decades of public service with a gala party or high profile media event, the ADSA approached the end of 2009 in its usual spirit of fellowship and consideration. 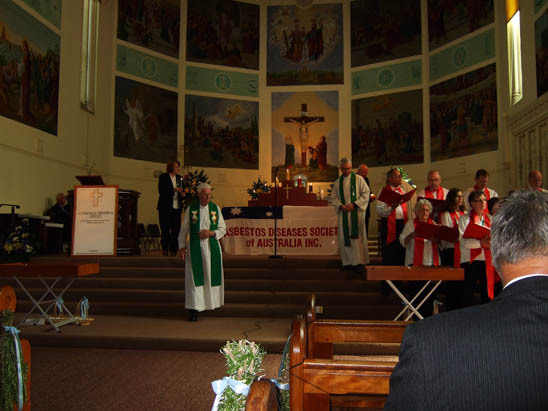 On November 27, 2009, the ADSA's 14th Ecumenical Memorial Service took place at the Redemptorist Monastery in the presence of Society members, medical and legal professionals, politicans and trade unionists. this year the NCARD board was notified by the federal government that this vital research funding would not be extended. Eminent researchers who have worked tirelessly for the past three years felt great disappointment that the federal government chose to ignore the beneficial progress of the research to combat mesothelioma. The current Federal Minister for Health bluntly declined the NCARD application for the continuation of research funding, which otherwise should have been a mere formality to replace the seed funding. As of January 28, 2010, attempts to elicit a response from Nicola Roxon, Federal Minister for Health and Aging, about the Government's U-turn regarding NCARD have been unsuccessful as have queries sent to Tony Abbott, Leader of the Opposition, who in 2006 launched NCARD in his capacity as the Federal Minister for Health. Present at the book launch were asbestos victims, campaigners  including a delegation from the ADSA  trade unionists, academics, journalists and reporters. Speaking of the silent epidemic in our midst, Peacock deplored the situation in which corporate executives were, with little meaningful opposition, able to seize the commercial advantage and by so doing contribute to an entirely preventable epidemic responsible for thousands of Australian deaths. Referring to the millions of asbestos-contaminated hessian bags which had been recycled as carpet underlay throughout Australia, he warned of the dangers lurking in every home.  and states that the Perth-based society has counselled more than 10,000 families and its workload is increasing. 2 It is little wonder then that the ADSA is the first of the eight groups listed under asbestos support groups towards the end of his book and that the assistance of ADSA President Robert Vojakovic and his wife Rose Marie Vojakovic, the ADSA counselor, is formally acknowledged by the author. Rose Marie and Robert congratulating Author Matt Peacock. The scope of the Society's contribution to Australia's asbestos victims is not easily communicated. From its offices in Osborne Park, it not only provides the vital advisory services so needed by people diagnosed with an asbestos-related disease but also presses for change at both state and federal levels which affect the legal, medical and social security rights of the affected. During three decades of existence, the Society has developed close working relationships with government organizations and key personnel so that nowadays there is, more often than not, a cooperative rather than a confrontational approach taken to safeguard the welfare of asbestos victims. Many of the changes which have taken place are described in an interview given by Rose Marie Vojakovic on December 1. Rose Marie, who received a Centenary Medal in 2000 and the Order of Australia last year (2009), is an upbeat, roll up your sleeves and get stuck in kind of gal. She is, without doubt, the kind of friend you need in a time of crisis. 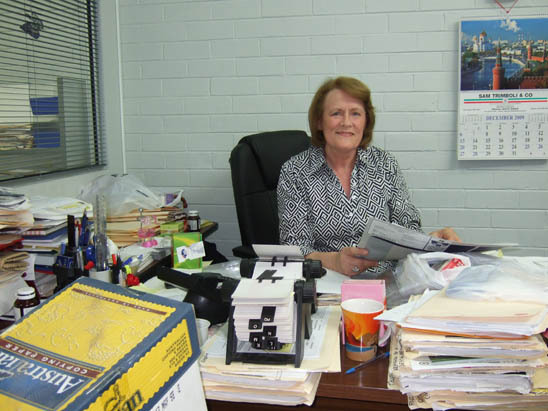 In company, her positive and cheerful manner helps jolly things along and creates a positive working environment for the many clerical and support staff at the Society's offices. In private, her ability to listen and her willingness to do whatever is needed makes all the difference to the people who find themselves in a state of shock and fear. Describing his dramatic inauguration as a member of the Society, one asbestos sufferer recounted how, having been diagnosed with mesothelioma on a Friday, the following Monday he called in at the ASDA offices. 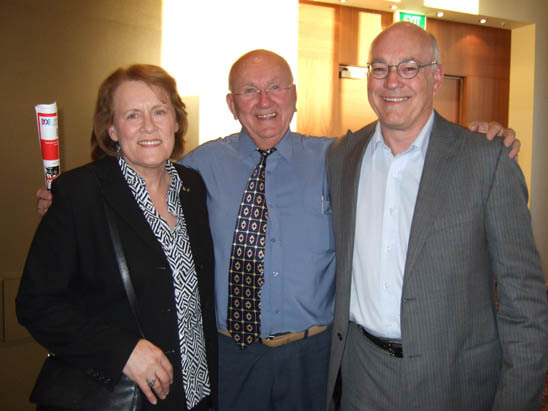 Rose Marie, he said just scooped me up. Having been shell-shocked by the fatal diagnosis, he and his wife were given the help and support they needed to deal constructively with the devastating news during protracted sessions at the ADSA on the following Monday and Tuesday. This help was given freely and without time constraints. What I do is invite them [the husband and wife] to come in together. A gentleman might ring me and say: 'Hey look, I've just been told this news and I don't know what to do about it and where do I go from here,' or 'I'm ringing you because my doctor said to ring you but I don't know why I'm ringing you.' I then will go through it with them and explain that the doctor has suggested they get in touch with us so that they can understand more; the doctor can give them 20 minutes and I'm going to give them as much time as it takes. 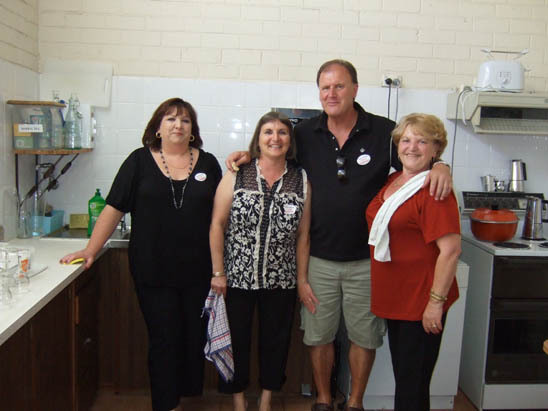 The Society provides social opportunities for asbestos sufferers and their families to enjoy the ordinary pleasures that make living in Western Australia so pleasant. 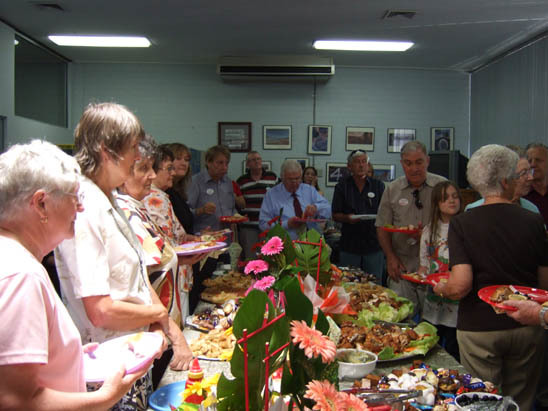 The USP (unique selling point) of the annual ADSA Christmas picnic, held this year on December 6, is the mammoth barbecue during which the asbestos victims' lawyers grill steaks and sausages for 600+ hungry picnickers. As usual, this year's event was held in the spacious grounds of Whiteman Park. Entertainment was provided by the Rhythm n Groove band which played old standards as well as Christmas carols; Peter Harries led an intrepid group band of youthful volunteers in an Australian rendition of the 12 days of Christmas. Nearly two weeks later, the annual Christmas Party for a number of the Society's mesothelioma sufferers and their families took place at the Osborne offices. From the amount of food provided, it looked like a small army was expected but the assembled guests and ADSA support staff did their best to consume the delicious food and wine on offer. 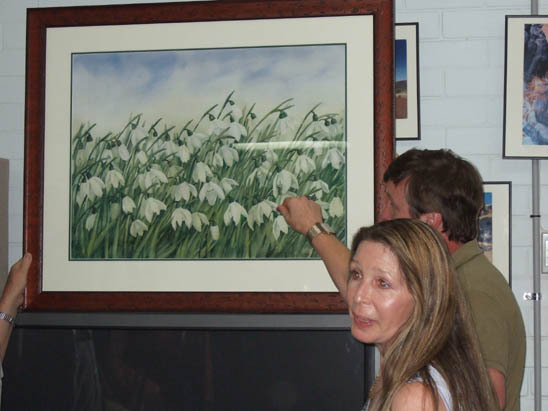 One of the guests  a Croatian member of the Society  performed an a cappella version of Silent Night while a mesothelioma sufferer, who is a talented artist, made a moving dedication of her study of snowdrops to Robert and Rose Marie. The artist presenting her painting to the ADSA. 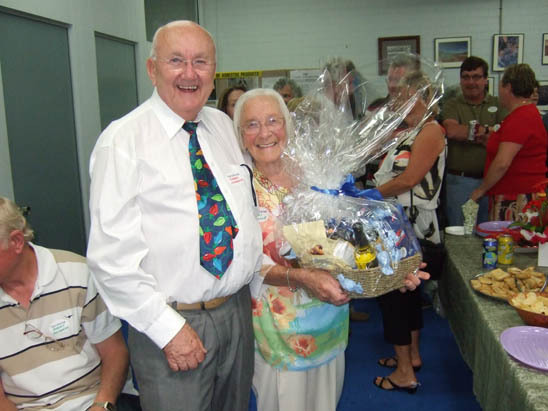 A prize draw for a Christmas hamper was won by a very delighted lady member of the Society. ADSA President congratulates the raffle winner. Some weeks previously, the gift hamper had been auctioned at a gala ball held by a local business group to raise money for the ADSA. The winner - a local lawyer  collected the hamper and delivered it to the Society's offices with a request that it be put to good use  it was. 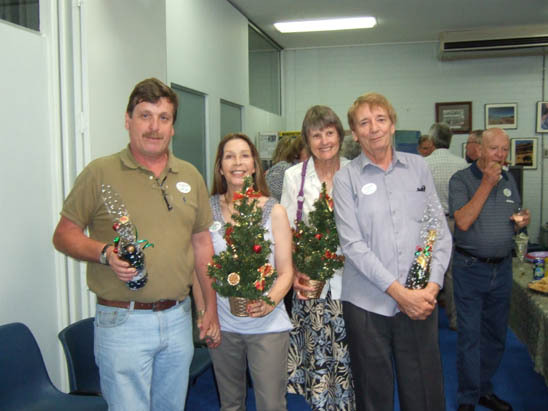 Rose Marie made sure that all the guests at the Christmas party left with a gift: the women were presented with beautifully decorated miniature Christmas trees while the men each received a bottle of Australian wine. From the comments made by many of the ladies, it was clear that the trees were a huge success: Now, I don't need to bother to get my Christmas decorations out, and this will look great on the table by the front door. It was obvious that this was a very well-judged present. The atmosphere of the party was like that at other Christmas gatherings with one significant difference; some of those present knew that it was likely this would be their last Christmas. None of the feelings which this knowledge engendered were on public display during the festive lunch as people mingled, chatted and socialized. Those people eager to exchange coping strategies and medical experiences with others were assisted by a simple strategy put in place by Rose Marie who color coded people's name tags so that those with green lettering were mesothelioma sufferers or family members. The effectiveness of this simple strategy could be observed by the various interactions witnessed on the day. ADSA volunteers interrupted for a photograph. Although the Society was scheduled to close its office on December 21 for the holidays, the fact that two new mesothelioma patients were due to be interviewed on December 18 made this highly unlikely. Whatever the calendar says, the injured always come first at the ADSA. Despite the aura of invincibility that seems to surround Rose Marie, on December 8 she was hospitalized by a recurrent chronic health problem. Confounding all her family and friends, she was back at the office to organize the December 17 luncheon. After 30 years working on the asbestos frontline, the Society might be forgiven for showing a degree of war weariness. That this is not the case is testament to the incredible commitment and compassion of Robert, Rose Marie, Dr. Greg (Deleuil), Antonella, Peter, the ADSA support staff and numerous ADSA volunteer members who drive patients to doctors' appointments, wash up after Society events, stuff envelopes and help out in any way needed. Together, this amazing band of people have created and sustained the unique institution which is the ADSA. Happy anniversary ADSA! 1 Kazan-Allen L. Asbestos Activism Down-Under. January 8, 2008. 2 Peacock M. Killer Company  James Hardie Exposed. ABC Books. 2009. p.320.